I remember when I first started looking for car seats and strollers, it is mind blowing how many options and models and sizes and features there are when you start to look. Some of great features, but are not really considered safe, others are very safe, but then don’t fit in your car it is a difficult to say the least. I was lucky and found MüV, they have an innovative car seat and base that just took my breath away. The way that the base moves to protect your baby is something that I have never seen before. MUV was born in Amsterdam, and our European roots have driven our team of experts to provide the epitome of modern, yet functional design for parents around the world. This company developed by parents for parents, each product is carefully engineered and crafted to reflect the essence of our inspiration. By focusing on the outdoor, on-the-go lifestyle of the Netherlands region, MüV enables families to explore their world in comfort and style. I love that this travel system is a perfect blend of safety, style, function and value! It makes it so easy to love being a family on the go! There is a whole world to explore and it is so much more fun with MüV products. Driving home with your new baby is exciting and nerve racking at the same time. You want your baby’s first trip home and every ride after to be comfortable, safe, and secure. KUSSEN can give you a little piece of mind knowing your most prized possession is as safe and comfy as possible. EPS energy-absorbing foam for the best head impact protection available on the market, this is something that was so important to me. I wanted to make sure that her little head would be protected in the event of a crash. It is so very key to the overall safety. Controlled motion base that responds to forces instantly by rotating to a more upright position, I have never seen a car seat of base that worked like this. It actually moves with the impact. I was told in driving school many years ago to let your foot of the brake if you are hit from behind so that your car has movement, this is to let some of the pressure off, and reduce injury. Have you ever had to carry a heavy baby inside a car seat out to the car, day after day? They get heavy and it happens so fast! With the MUV it has a Delta multi-grip carrying handle has an ergonomic design and contours that provide a more natural carrying position. An amazing feature because, let’s be real, babies in car seats are heavy. It is also equipped with plush fabric, an 8-position adjustable head support, and 4 recline positions on the adjustable base keep baby comply and cozy. When baby is cozy, baby is happy and that means happy parents. It all works together. Comes equipped with rigid LATCH connectors making proper installation instant. This stroller called the REIS is amazing as well. This thing actually has a cooler attached to it, to keep all of those baby things cool and perfect. You can put sippy cups and even snacks in there. The whole REIS stroller is modular so that you can use it with the car seat, with the stroller seat or even with the bassinet that is included. I have to say when baby is tiny a bassinet option is so great! The one thing that you want to splurge on when you have a new baby is a great stroller! You are going to be pushing that for at least 3 years, you need it to work well, and you need it to function when you are ready to go. I love all of the options that it comes with and how easy it is steer and push. 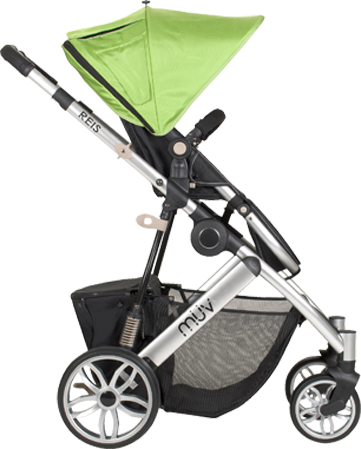 Any mom would love to have this REIS stroller waiting in the back of the van waiting! EXPLORE KUSSEN at their website here and follow on their social media channels below!